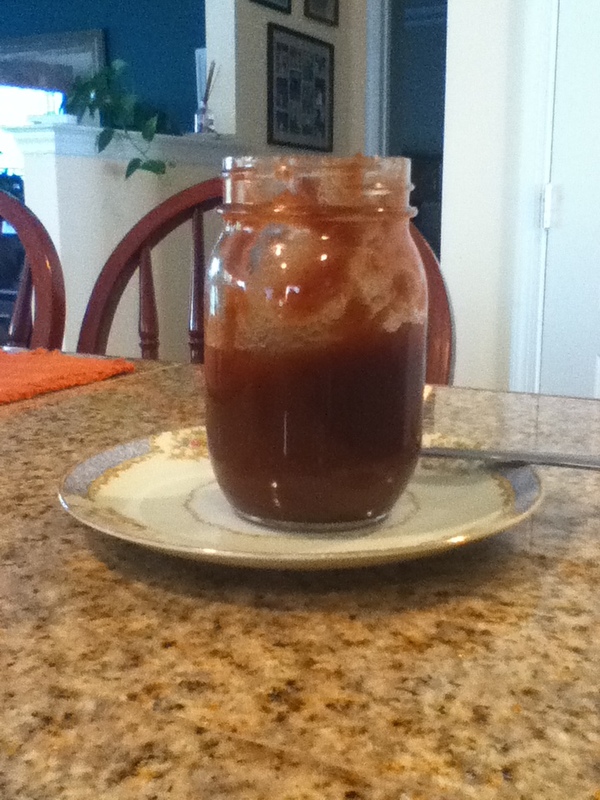 A few posts back I wrote a short entry on apple picking and apple butter, asking for a good recipe. Well thanks to Calandra (good lookin out cuz!) a recipe was sent, which I tried out a few weeks back. It’s a slow-cooker recipe and when they say slow cook, they mean slow cook! It took 12 hours in the crock pot but my, was it worth the wait! One bite on a piece of bread and I was transported to my grandmother’s house in Asheville, NC, sitting at her dining room table enjoying apple butter on white bread. Now it’s wheat bread but the apple butter tasted the same–full of apply, cinnamony goodness. I kept a jar and gave others to a good friend and my NC-raised father and aunt. The next batch may be Christmas gifts! Here’s a picture of the half-eaten jar at my aunt’s house. Scrumptious!